I love eating out. Something about it is just so much fun: You don't have to worry about cooking and you can pretty much eat anything you want based on what you're craving. Japanese anyone? There's only one problem: Waste. At most eateries, they'll serve the food with silverware, cloth napkins, and reusable cups, but not every restaurant is the same. I've encountered my fair share of restaurants (and food courts) that use plastic straws, paper napkins, and even plastic cutlery. 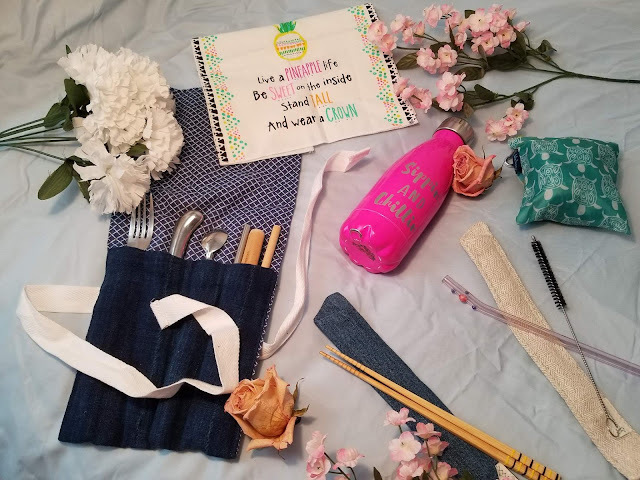 Since I eat out at least once a week, I decided it was time to create a zero waste travel essentials kit for myself. That way, I'd be prepared for (almost) anything that was thrown my way. I hope by showing you what's in mine, it will inspire you to make your own, or improve upon the one you already have. The travel essentials I have gathered are all important items to living a more conscious, waste free life. 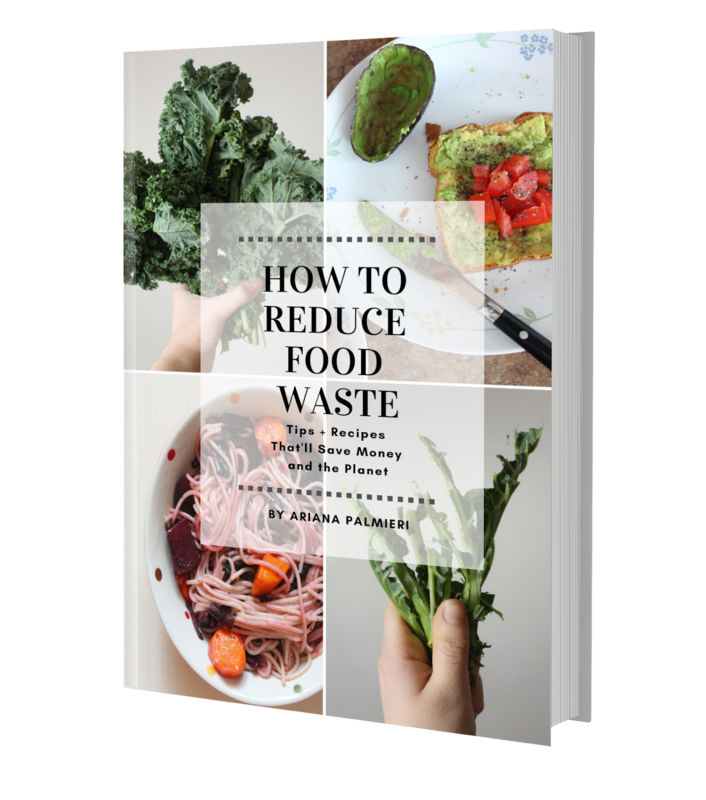 I have the zero waste community to thank for this change, seeing as just a year ago I wouldn't have thought to do this. Now, I can happily say I sport a reusable napkin, a stainless steel water bottle, a multi-utensil kit, a reusable produce bag, and reusable straws with me everywhere I go. 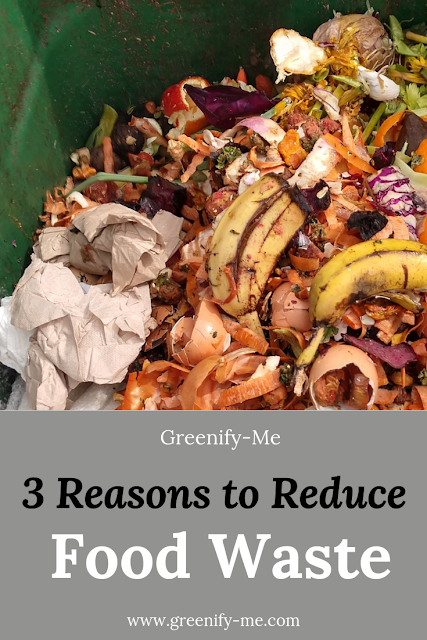 This greatly helps me reduce the waste I put into the environment every time I'm out and about. I'm still learning the fine art of refusing certain things (like plastic straws), but I'll master it eventually. The important thing is, I'm trying. That's more than most people can say they're doing. And yes, the travel essentials I carry around are far from perfect, but that's okay. In fact, they're a work in progress. I have a list of everything I still want to get, but I'm happy to say that list is no longer as big as it used to be. I now (literally) go everywhere with these items. It's not pictured below, but I have a huge bag I carry all of these in. It's a really cute black sling over bag made out of ethically sourced, fair trade cotton. The bag itself is handmade and has a pretty Indian elephant on the front of it. It's safe to say I'm pretty obsessed with it. I literally bought this bag specifically to create this zero waste travel essentials kit. I knew the items I needed wouldn't fit in my regular bag (which was a sling over, but could barely fit my reusable water bottle in it), so I took the plunge. I use my sling over bag to carry around a lot more stuff than just my zero waste travel essentials though, that's for sure. It's roomy enough to fit my keys, phone, wallet, makeup, and even a book or two! Sometimes, if I know it'll get chilly out later, I'll even stash a sweatshirt in there. That's how roomy it is. So, it's safe to say that if I would like to expand on this zero waste travel essentials kit, I certainly can (and will) in the future. The possibilities are endless! Now, without further ado, here's a peak inside my bag. Out of everything in this bag, this is the one item I've had the longest. Before I even assembled this on-the-go kit, I knew I had to get a reusable water bottle. I drink a lot of water, and to stay on my game, it just made sense to buy a stainless steel one. 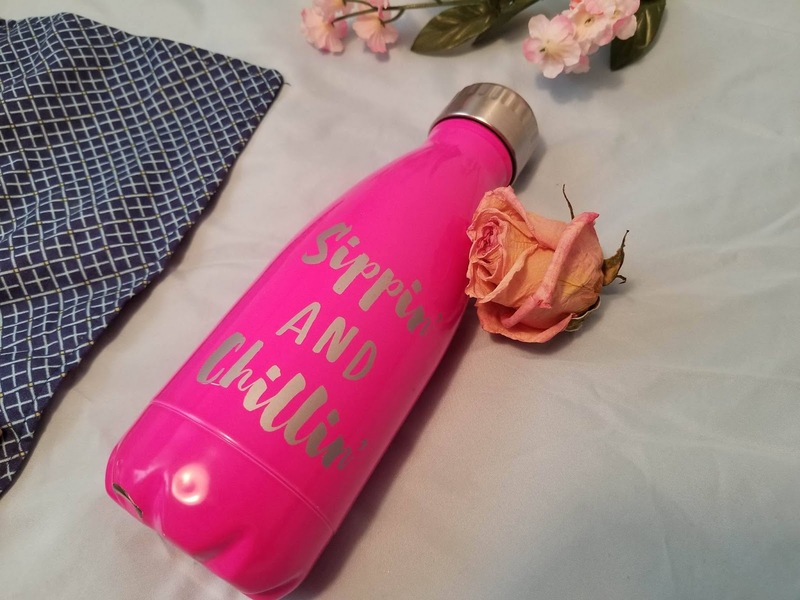 Stainless steel is probably one of the best materials you could pick for a water bottle, because it's great at keeping your drink cold (or hot - you can carry tea in it too!). I strictly stick to water for my bottle, but if I want to switch it up one day, I totally could. This bottle comes in handy at family gatherings, parties, or just in general when I'm out on the town. I don't typically use this at formal restaurants, though I will use it at food courts. If I get thirsty, I don't have to buy a single-use water bottle (or drink from a plastic solo cup). Instead, I just reach inside my bag, grab this, unscrew the top, and take a swing. Boom, I just saved another plastic water bottle from polluting the earth. And trust me, we don't need any more plastic being created on this earth (we already have too much to handle!). I'm also a big advocate of water filters. That said, most stainless steel water bottles don't come with a filter. 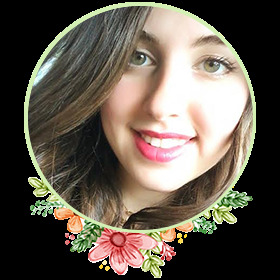 For a while, I struggled with finding a filter for it that would be both plastic-free and sustainable. That's when I learned about bamboo charcoal, which purifies water naturally and also improves its taste. I simply boil the charcoal for 5 minutes, let it dry, then plop it into my water bottle and let it sit in the fridge for 1 hour. The boiling only has to be done once a month with 3-4 new pieces of charcoal, so it's a fairly easy process. After that, I just keep adding water to the charcoal and leave them in my reusable bottle! It automatically filters the water after one hour is up. The best part is the charcoal is compostable. How cool is that? It's safe to say I will never filter my water any other way. I bought this stainless steel water bottle at a store in my mall called Francesca's for about $18, if anyone is interested. It's really cute, right? I love the color pink so I pretty much snatched this up as fast as I could. Plus, come on, who doesn't love the cute catch phrase "sipping and chilling" on the front? I know I do! I've always wanted a multi-utensil pack because I think it's so important to carry around reusable cutlery. As a zero waster, it irks me how many people use plastic cutlery on a daily basis, then just toss it away after one use. That plastic will sit in a landfill, or be mistake for food by marine life. Either way, it's just unacceptable. I refuse to take part in it any longer. That's where this multi-utensil pack comes in: I use it to carry a knife, a spoon, a fork, and straws everywhere I go. It has seriously helped me avoid single-use cutlery, especially while in the food court in my mall (that's all they give out). After I'm done using the cutlery I pack in this baby, I just wipe it off and store it back in the pack. When I get home, I wash it off in the sink, easy-peasy, and store it in the pack again. 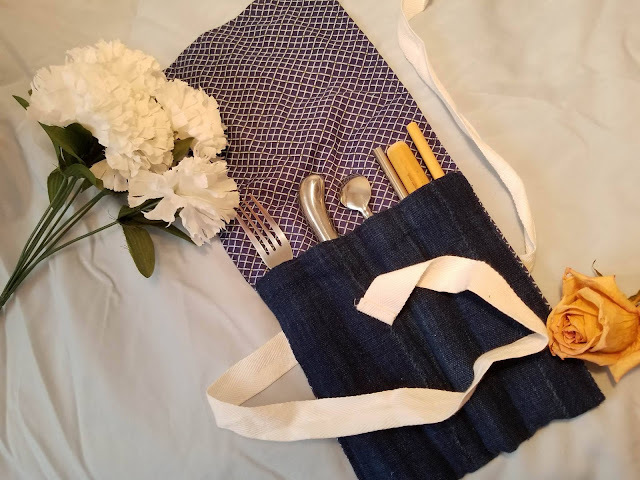 My multi-utensil pack is made from reclaimed denim and cotton, but there are so many different options to choose from. 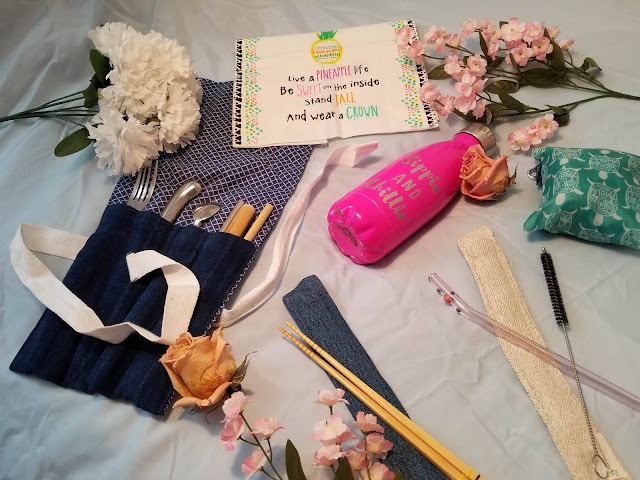 The brand I received this pack from is StrawSleeves, a company dedicated to providing a practical way to carry reusable straws while traveling, shopping, or eating out. 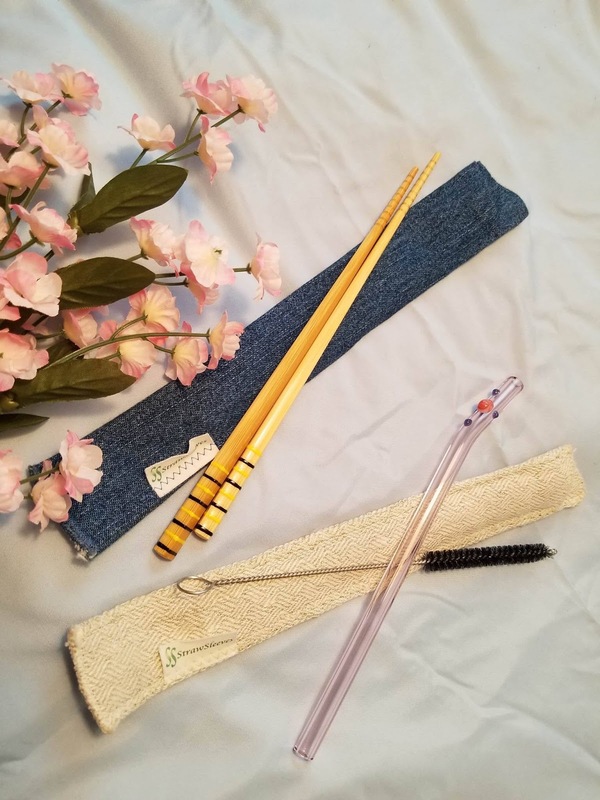 I have a few more items from StrawSleeves in my zero waste travel essentials kit, such as straws, and straw sleeves themselves. All of it is super handy stuff. The straws I got from them are really great too, and I keep them all in this multi-utensil pack. I got one big bamboo straw, a slim bamboo straw, a spoon straw, and a stainless steel straw. The spoon straw is cool, because it doubles as both a spoon and a straw, so I don't need to even grab a spoon from my kitchen drawer. The bigger bamboo straw I usually use for drinking smoothies or bubble tea while out and about. The slim bamboo straw and the stainless steel straw are used for ordinary drinks, like iced tea or water served at a restaurant. This multi-utensil pack is for more than just straws and cutlery though: I could also use it to store makeup brushes or even art supplies! The multi-utensil pack is machine (or hand) washable, but mine is still really clean right now. When I'm done using it, I simply close the flap and use the ties to secure it. I usually tie it in a pretty bow, then plop it into my bag. It stays perfectly fine in there. I usually just leave it in my bag and don't bother taking it out at home, that way I never forget it (especially when I'm in a rush to leave the house!). It costs $26.95, but is totally worth it (I know I'll use it for years to come). Out of all the items on this list, this is the newest one I have. It's also the one I'm still getting used to using the most. I've used cloth napkins at restaurants, don't get me wrong, but it's different when you know that napkin will be going straight back into your bag. You almost don't want to soil it too much, because you don't want to get the other items in your bag messy (and/or sticky). Having this cloth napkin has come in handy though, and I have used it. I haven't used it all too much though, as I try to stay as clean as possible while eating. I've got a big appetite, but somehow manage to stay clean through most of my meals. There was a time when I used to use practically all the napkins at a table, but I've very much so grown since that time. I'm happy to say I barely use this one! It's machine and hand washable, so I'll probably just wash it in the sink like I normally do with the stuff I own. I don't have constant access to a machine washer in my apartment (we have to pay for laundry), so it's the easiest option. I'm going to wash it before the weekend is out, just so I know it's clean (right now it's only been lightly used). I have to keep reminding myself I have it, so I hope eventually, with time, I'll get used to that. Also, I would love to buy more reusable napkins, so that way, if one is completely filthy, I can just use another. That's a work in progress though, so I'm grateful to have at least one right now. I purchased this at Francesca's (the same place in the mall I got my reusable water bottle), if you're wondering. Believe it or not, that store has a lot of very pretty reusables! You just have to keep your eye out for them. I also loved the tag for this item - it was pin and a piece of (plastic-free) paper, which I simply added to my compost pail. It only cost me about $12 too, so it was worth the investment. 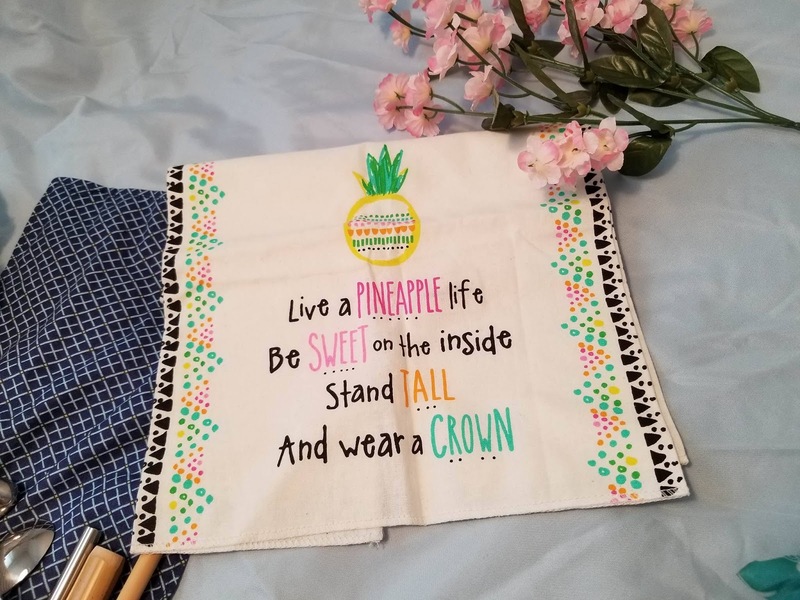 I also love the phrase "live a pineapple life, be sweet on the inside, stand tall, and wear a crown" on the front. Too cute! I'm a germaphobe, so protecting my utensils from the contents of my bag is a huge deal for me. Straw sleeves are literally life savors: I use them to protect my favorite reusable straw and my vintage chopsticks on the go. They're also incredibly easy to use: I find myself reaching for these a little bit more than my multi-utensil pack. That's only because it's quicker to remove anything I store in them (I don't have to untie anything). Currently, I'm using them to store a reusable glass straw and a pair of chopsticks. I can even fit a straw cleaner right next to my glass straw, if I wanted to. I eat sushi a lot, so chopsticks are a must for me. My father is the one who gave me the ones pictures above: He had them since he was younger and bought them in China Town. Yay for hand-me-downs! The straw pictured above was one of the first zero waste things I ever bought (but at the time I had no clue what the zero waste movement even was). I simply bought it to be more environmentally friendly, and because I thought it looked really pretty. These two items go great with the straw sleeves because they're easy to remove and I love using them. The straw sleeves themselves are made from interesting materials: The blue one is reclaimed denim and the white one is made from hemp. They're clearly plastic-free and machine (or hand) washable, which is a huge plus. Each material comes in a variety of colors too, the ones pictured are just two options. To use the straw sleeves, I simply slip a reusable straw of my choice (or the chopsticks) into the sleeve. It stays put because the straw sleeve has an "invisible inner cuff" that prevents the utensil from sliding out of the pocket. That's why it requires no ties or fasteners, which is awesome. After the utensil is in the sleeve, I just plop it into my bag. Super effective! I could probably even use these to carry around pens or pencils if I wanted to. Maybe I'll give that a try in the future. Straw sleeves are also really easy to take care of and don't require much washing. I haven't had to wash them yet at all: They're fairly new and clean. They are pretty genius though, don't you think? Each one is bound to last me at least 5 years, if not more (depending on how well I care for it). Each straw sleeve, no matter the material, costs $12, which isn't much. It's perfect if you recently bought a reusable straw but don't know what to store it in. Plus it's really unique and cute! To market, to market...to buy some produce! Every Saturday my mom and I go to the farmer's market to buy a bunch of fruit and vegetables. It's a great experience, but what makes it even greater is this little thing. In the picture above, you can't really tell what it is, can you? Well, looks are deceiving: Inside that little packet is a big reusable bag! 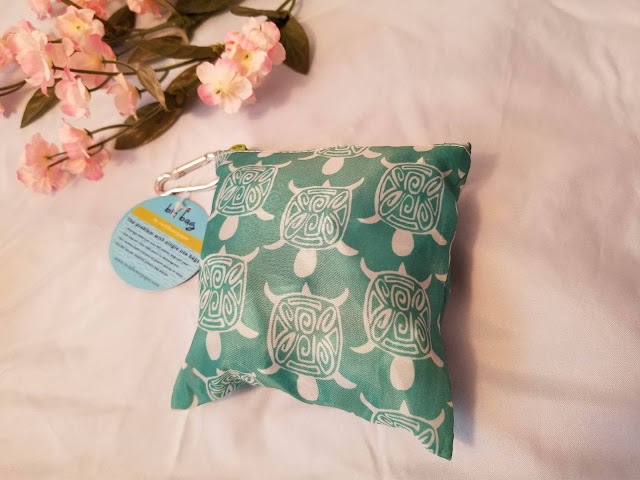 It's so easy to stash in my bag because it folds in on itself and can be zipped up in the tiny pouch you see pictured. I keep it in my bag at all times and when I need it, I simply unzip the pouch and pull out the bag inside it. It's got really cute sea turtle designs on it. The coolest part about this bag is that I can use it for almost anything. If I wanted to go shopping, I could use this to hold my purchases. I mainly use it to hold food from the farmers market though, along with two other reusable bags. The difference between those bags and this one is that this can be stored in my bag at all times, thanks to the pouch. With my purchase of this bag, money was donated to the Ocean Conservancy, which is great. It also helps keep plastic bags (the single-use ones) out of the sea, which make for healthier oceans and healthier lives. I bought this (can you guess?) at Francesca's as well. What can I say? I love that store! I told you it has reusable items in there. What I love a lot about this purchase is the information it shows on the tag: It talks about the problem with single use bags. For example, did you know the average American uses 300 plastic bags per year? Or, that one bag can take 1000 years to disintegrate? It's sad, but true. So if you haven't switched over to a reusable bag, I highly suggest you do! This makes traveling so much easier: Plus it's even machine washable! What's in your zero waste travel essentials kit? Mine is far from complete, but it's almost there. Let me know what you take with you on the daily in the comments below! This post was sponsored by StrawSleeves. All thoughts remain honest and not influenced by a third party. Thank you for the tip about the reusable chopsticks 😊 now I want to sew the chopsticks sleeves for me and my family. This is good. Small reminders that make a big difference! I love reading your articles. It is important to reach more recipients.